Receiving a gift is a positive card. This card brings you happiness. There are the external influences that will make it sure. It stands for getting a present, that other people like you and they also show their feelings to you. Look forward, because today you will get gifts of money or a gain! A wonderful day is waiting for you. 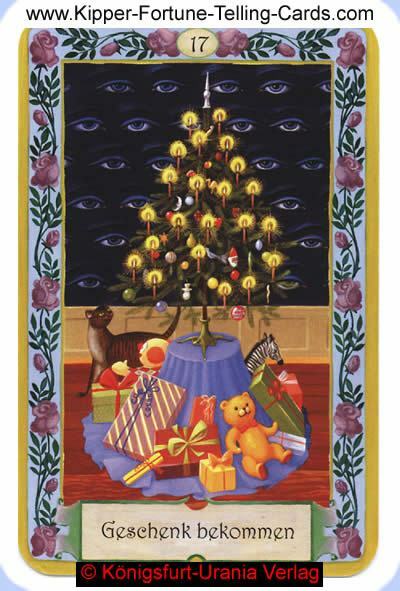 This card comes to you because your friends care about you and think of you. Do you care enough about your friends? Nice people should be allowed to get a attention! It would be good for you to laugh heartily from times to times. If you think that your life is dark and bad, then a little light will come from somewhere. The card receiving a gift is positive so the answer will be yes. The Kipper card receiving a gift brings you good luck and fortune. There are external influences which will help you that your dream becomes reality.